Tom Auer, owner of landscape design and construction firm, The Ground Crafter, contacted me the first of the year about using some of our Leaf Imprint tiles for an upcoming trade show exhibit they would be attending. He explained that the tile were to be used on a water feature for an accent. He also let me know that he needed them right away. Unfortunately, we did not have any of the 8"x8" pieces in stock and the smaller 4"x4" format wouldn't work for him. I always hate to disappoint a customer; but, I also try to provide a realistic delivery window. Handmade products require time and often don't work for projects that are on a tight schedule. If it can't be done, c'est la vie; but, let's look at the options. Avente works closely with its tile artisans and sometimes, we can beat the standard delivery time or find ways to improve delivery with expedited freight or shipping. I told Tom that we might be able to make the tiles and still meet his deadline. 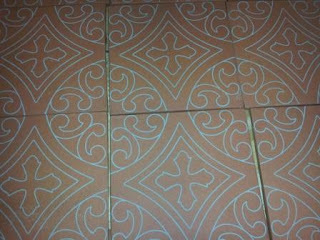 Of course, the artisan agreed and the tiles arrived in time for the show. Tom was kind enough to share a few photos of the tile installation and their exhibit space. Here are the results! Our Leaf Imprint tiles are popular kitchen backsplash accents; but, I think this is the first time they have been used as part of a trade show set. I've been to a few trade shows in my day and the exhibit show-stoppers are usually going for "wow" or "big." The Ground Crafter team created the most tranquil, peaceful exhibit space I've seen. I noticed they even included benches and cushions. Smart decision. Not only does it make the space more cozy, but also adds visual value. Seating at any trade show is hard to find. My congratulations for a nice job, Tom! I'm glad we could help with the tiles. The tile's stony matte finish accents natural stone beautifully and you can see that Tom took the same cue. In this installation, the Leaf Imprint tiles take center stage to a backdrop of flagstone and peaceful, flowing water. The look is further enhanced with the use of stained wood frames around the tiles, which really makes them pop. A similar "picture frame" effect can be achieved with ceramic tile molding in wood tones. The variation found in each hand-painted tile mimics nature in that no two hand-colored leaves are exactly the same. Pressed with real leaves, these decorative hand-painted 8"x8" tiles include a Maple Leaf, Ash Leaf and Ginkgo Leaf design. Tom chose one of each design in the 8"x8" format to create a triptych that has perfect balance. Thanks again to Tom and his crew for sharing sharing how they used our tiles in a unique installation. The Ground Crafter is an expert team of designers, landscapers, carpenters, masons and gardeners. They have skills for advanced landscaping projects, including both code-compliant electrical and plumbing work. The company's mission is to create healthy, beautiful environments that enhance the quality of life. If you are in the Milwaukee, Wisconsin area and in need of landscape design, stop by and see Tom and the team. They are located at 1409 W. Wanda Ave.
Are you looking for further inspiration with hand-painted decorative tiles? Then visit our Ceramic Tile Design Ideas portfolio for detailed installation photos and concepts. If you enjoyed this article, then you might enjoy these Tile Talk articles that show how Avente customer's have used our hand-painted tiles in their homes. Our customers have also used tiles to add style and a personal touch to their home. Here are a few posts devoted to tile floor accents and kitchen backsplashes using our hand-painted ceramic tiles. NOTE: Images of the above trade show water feature are courtesy of Tom Auer, owner of the landscape architecture firm, The Ground Crafter. Handmade products have always intrigued me. I appreciate the time, the effort and the passion that goes into creating something with little or no need for machinery. Our hands have always been our best tools, but when things need to be made in massive amounts, then machinery can play an important role in helping to meet the demands of impeding deadlines. 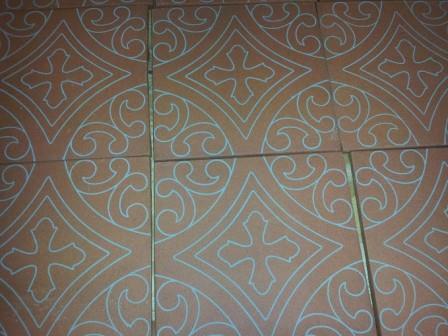 ARTO's Normandy Cream cement tile board is getting ready for shipment. There are four textures in this combination: Travertine, Luna, Limestone and Standard (smooth). Thus, when I recently toured the ARTO Brick and California Pavers factory complex in Gardena, CA, along with several architects and designers, I knew I would be in for a treat. Over the years, I have been on several tile manufacturing tours, but let me stress how excited I am for each and every tour. I’m literally on edge wondering what we’re going to see next. Let me put it to you this way – I’m the main character of the movie “Groundhog Day.” Yes friends, any previous tour I may have participated in gets wiped clean out of my memory! You may be wondering why that happens. “It’s just tile,” I’ve been told. Well, good point. With that theory, you can also say that a Pacer and Ferrari are “just cars,” right? And that’s when the highly animated arguments over engineering and craftsmanship start, and then, it happens. They get what I’m saying. And with that, let’s continue our look at how ARTO delivers on its promise of handmade quality and longevity. With the vast majority of raw materials sourced locally, each ARTO product is manufactured with concrete. Concrete’s lifespan can not only be measured in decades, but it can also be measured in centuries. You only need to refer to ancient European ruins to see how the properties of cement tile remain time-tested elements of any structure. 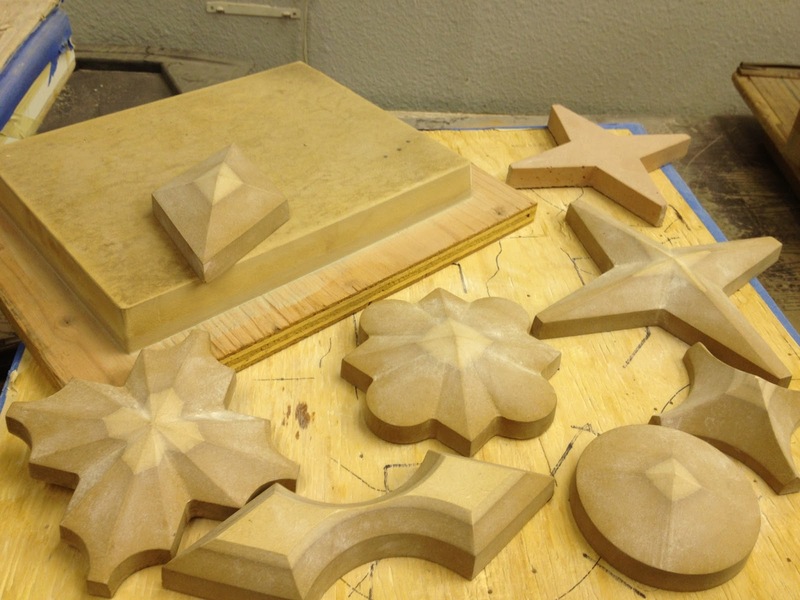 Before the process of tile-making commences, molds must be made. There are several types of molds used at ARTO, including rubber, plastic and metal. 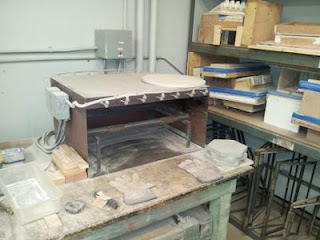 Each mold has a specific purpose for the type of tile it will help produces. For example, rubber molds are first created using carved wooden pieces where the rubber is vacuum-formed over the wood. These rubber molds offer a higher level of detail, flexibility, and they can be used repeatedly. These humble pieces of wood will soon contribute to the handmade tile-making process. Wooden forms are carved out to the exact specification of the plastic mold that will form the tile. These shapely tiles are the product of the wooden blocks and the rubber molds they helped create. 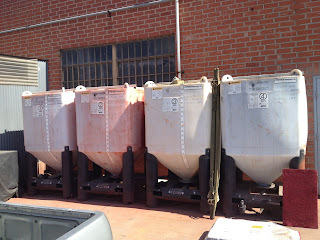 Our next stop on the tour included a peek into the science behind the coloring process of concrete tile. ARTO used the Davis Color Chameleon Liquid Color System for mixing the wide assortment of pigments needed for their concrete tiles. With this system's dded flexibility, they are able to offer dozens of color options for to their clients, including customization services for specific shades. Honestly, the possibilities seem nearly endless! These massive tanks hold the colors that will be mixed and used for creating the various shades of colors available in ARTO’s cement tile product line. Lastly, it should be noted that ARTO not only believes in sustainable practices, but they practice what they preach in an energy-efficient facility. For example, the vast majority of raw materials needed to produce their tiles are sourced locally. Also remember that each ARTO product is manufactured with concrete. Concrete’s lifespan can not only be measured in decades, but it can also be measured in centuries. In my next post, I’ll take you through the handmade tile-making process where you’ll see a dedicated team of well-trained professionals producing ARTO’s masterpieces, one piece at a time. I know I gain a better appreciation of what goes into producing a handmade piece of tile, including those carried by Avente Tile and their extensive line of Cuban Heritage cement tiles. I'd love to hear your experience with handmade tile! Did you require custom colors, sizes or shapes? Were you pleased with the outcome? The green of Saint Paddy's day, springing the clocks forward, and the warmer temperatures have us thinking about Spring and the outdoor garden. Our Gourmet Garden Matte tiles create a classic kitchen theme of fresh-picked fruits and vegetables. The matte finish works well with tumbled stone, like travertine or marble. The slightly uneven edges create a charming and slightly rustic feel. Each tile is exquisitely hand-painted in relief. The backsplash shown uses 4"x4" tiles in a checkerboard mosaic pattern, and is framed with a charming twig border created by the same artist. Create your own mosaic backsplash by choosing your favorite vegetables or colors! As the emblematic color of Ireland, green represents the vast green hillsides, as well as the country.s patron saint, St. Patrick. Green is regarded as the color of eternal life in Japan. In the Aztec culture, green was considered to be royal because it was also the color of the quetzal plumes used by the Aztec chieftains. The Chinese believe jade stones represent virtue and beauty. The Portuguese believe green represents hope because of its association with spring. In the highlands of Scotland, people wear green as a mark of honor. So you see, March is not only synonymous with the color green and Spring, but it also represents royalty, virtue, life, and honor, too. In honor of this wonderful month of March, we've selected a sampling of ceramic and cement tiles that would fit in perfectly with your current or upcoming projects! Did you know? Go Green with cement tiles! 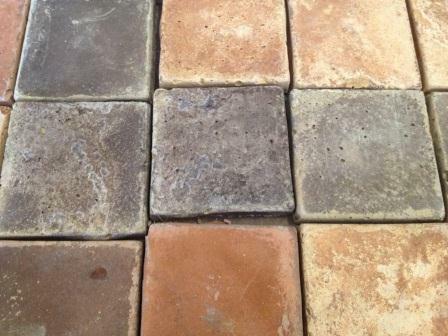 While we are celebrating the green, did you know that cement tiles are considered a green product? used in our manufacturing process is very low. fuels are used during the tile production phase. Harmful chemicals that may affect the environment are never used. Plentiful local materials like sand and aggregate are used to minimize transportation of raw materials. As the founder and owner of Avente Tile, I take great pride in offering each of my clients a diverse and unique professional experience. 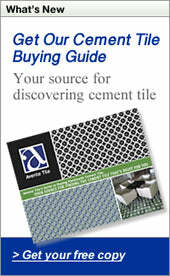 Since it's inception in 2003, Avente Tile's online tile showroom has sold hand-painted ceramic tile, handmade cement tile, and artisan tiles through various channels of the internet, including our website, this blog, Facebook, Twitter, Houzz, guest posts, and most importantly, word of mouth and repeat business. So imagine my excitement when I was selected to participate as a panelist in an educational session for tile and stone professionals, Selling Tile: The Internet, the Industry & the Consumer, during Coverings 2013 in Atlanta, Georgia. The interactive panel discussion, scheduled for May 1 at 3:15 PM, is designed to show how the internet is influencing the sale of tile to the consumer. From strict sale policies, to reduced prices and no sales tax, the internet has created a new frontier for the industry to navigate. I’m honored to share the unique perspectives and practices that can lead others to success when it comes to creating a brand and online presence. I started Avente Tile as an online tile showroom and catalog - to make hand-painted ceramic tiles and cement tiles broadly available for others who share the same passion. The internet excels at bringing unusual and divergent communities together. From the day I started the company, I’ve found acceptance and demand for this niche product. Further, I’ll be sharing the discussion floor with three additional panelists. The discussion will be led by Christine Whittemore of Simple Marketing Now. Christine encourages the use of content marketing including blogs and other inbound digital marketing and social media to add value to your company and message. I met Christine at a Coverings tweet-up almost four years ago. I’ll focus on the virtual showroom perspective and provide tips for more effective web sites and how to determine if an online catalog or e-commerce solution might be right for you. I'll also discuss how Social Media and blogging can save you time and may help bring customers to your virtual or brick-and-mortar store. Additionally, I am honored to share the stage with two panelists, who are also from Southern California. Steve Slutzah, President/CEO, of Westside Tile and Stone, Inc. in Canoga Park, CA, and Beverly Hills, CA. Westside Tile and Stone is one of the premier tile stores in Southern California. I met Steve several years ago while attending an educational session at Coverings. Also on the panel is Tom Carr of Pan American Ceramics, Inc., who'll represent the distributor perspective. Pan American Ceramics, Inc. is an importer, exporter and distributor of ceramic and porcelain floor, wall and counter tiles, as well as glass and stone mosaics. Rounding out the list is Dave Milanowycz, Director of Sales for Independent Distribution for Florida Tile. Dave will share some of the unique challenges, benefits and insight that the internet poses to the manufacturer, distributor, and retail chain. Last year, during Coverings 2012, I gave a short, informal presentation and shared tips on How a Social Media Presence Improves Retail Sales. It was a great opportunity to provide insight and hear the struggles that folks face everyday. I've been attending Coverings for over a decade now. It's a yearly pilgrimage for me, and it's the one trade show I never miss. Besides discovering what is new in the world of tile, the event allows me to develop existing relationships, build new ones and gain valuable business insight. If you are a tile and stone professional, it's essential to you and your business to attend Coverings. I hope to see you at the panel discussion, and I'm eager to have you share your thoughts and insights as well. Los Angeles is a place where California history is still held sacred. Amongst the downtown skyscrapers and recently built Civic Center facilities, such as the Walt Disney Concert Hall designed by architect Frank Gehry, you’ll find everything from Olvera Street (the birthplace of the city of Los Angeles, which started as Pueblo de La Reina De Los Angeles in 1781), to Union Station (built in 1939 in a modern, Art Deco, Mission/Spanish Revival architectural style), and everything in between. Arto Alajian's signature on brick is proudly displayed at the ARTO's Brick and California Paver factory in Gardena, CA. With history on their minds, I, as well as several architects and design professionals, recently toured the ARTO Brick and California Pavers factory complex in Gardena, CA. Along with the tour, an American Institute of Architects (AIA) Continuing Education Course, “The Beautiful Face of Concrete: Using Precast Tile, Pavers, and Wall Veneer for Historic Restoration and Renovation,” was offered. ARTO Brick, which has been in operation since 1966, was founded by the company’s Armenian namesake, Arto Alajian. In his birthplace of Egypt, Arto got his start in the business world by helping his father as a shoe cobbler. Later, when the family moved to Lebanon, Arto continued honing his artistic talents with various mediums, including installation of tiles. Shortly after his arrival in the U.S., Arto found his calling producing a lightweight, thin brick veneer. ARTO's Antik tumbled brick veneer. Photo courtesy of ARTO. Since the company’s inception, the product line has expanded to include the manufacturing of concrete and clay tiles, ceramic tiles, rustic pavers, brick veneers, pool coping, wall caps, pier caps, fountains, moldings, and balusters. Forward now to more than 45 years later, and you’ll find unwavering commitment to craftsmanship within the inner workings of this Los Angeles gem. Together with its ARTO Tile Studio, and the recently bought Western Quarry divisions, ARTO Brick has garnered a reputation for quality, good stewardship, and an environment where a family-like relationship is nurtured amongst the owners, their employees, the company’s dealers/retailers/distributors, as well as their customers, and those who look to ARTO for their expertise, such as architects, designers, and specifiers. ARTO’s Tile Studio is “a division of the ARTO Family of companies who are dedicated to the preservation and enhancement of the Old World craftsmanship distinguished by the rich tradition of California tile making and decoration which was perfected by both Malibu and Catalina Potteries in the early part of the 20th century,” the company says. It’s by adhering to these time-tested traditions that ARTO continues its growth, which has necessitated the expansion of its Gardena location. Now, let’s take a look at what defines hand-crafted, hand-painted tiles by examining the process of silk-screening to glazing. 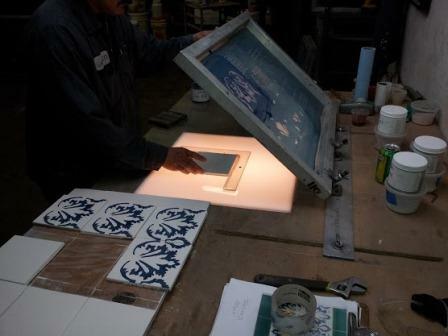 The method of Silk Screening transfers an outlined image onto the tile. 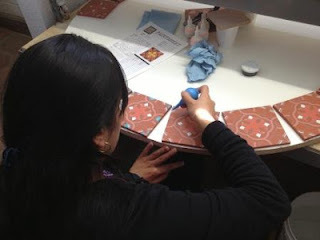 This process creates “a pattern and guide which our artisans use during the glaze application. This outline image acts a resist barrier known as Cuerda Seca," ARTO notes. In short, this barrier prevents various glaze colors that are used on the same tile from blending together during the kiln firing process. Silk-screening transfers an outlined image onto the tiles. The outlined image now acts as barrier known as Cuerda Seca. These silk-screened, or stenciled, tiles are now ready to go into the glazing room where they will be handled by tile artisans. From the silk-screening area, the tiles are then sent to the skilled artisans where each piece is carefully glazed by hand, piece by piece. Through their expertise, these artisans take precision to a new level by not allowing any color to cross the barrier of the Cuerda Seca. It isn't until after the tiles are fired where their true beauty is revealed. 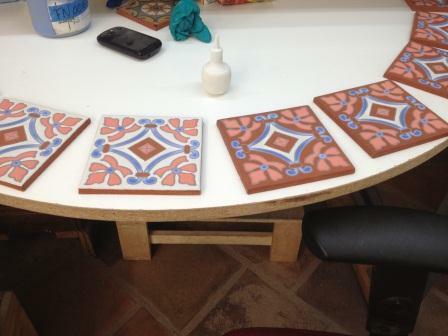 These Cuerda Seca tiles have been hand-glazed, one-by-one, by the artisans at ARTO. Using a bulb for delivering the proprietary mix of colors and components needed for each pigment, these tile artisans hand-glaze each piece with ease and perfection using the Cuerda Seca technique. I hope you’ve enjoyed the first part of my profile on ARTO. In my next couple of posts, I’ll be digging deeper into the inner workings of ARTO’s manufacturing process of cement tiles, brick pavers, and more. Would you agree that seeing a creative process, such as handcrafted tiles, gives someone a deeper appreciation of the time and expertise involved in producing one tile? Which creative processes would you like to see featured in future posts? 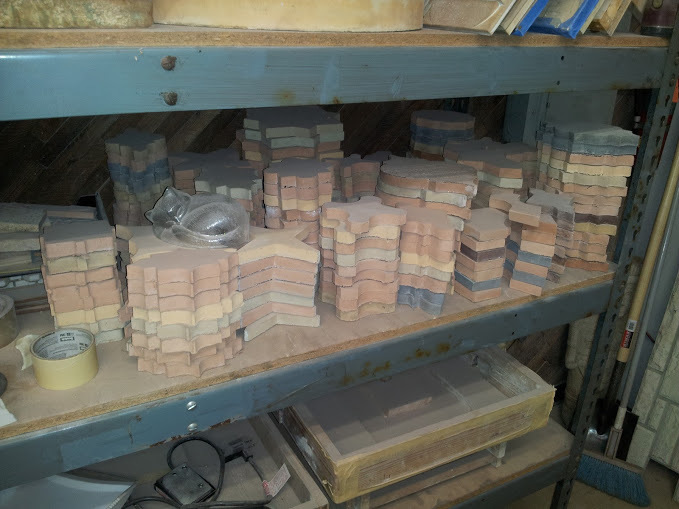 Editor's Note: If you enjoyed this post on the Cuerda Seca tile making process, you might also enjoy these posts that explain other tile making processes.